Susan and Robert Erskine speak to STV News about the secret of an enduring and successful marriage. 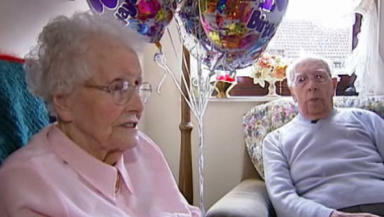 Scotland’s oldest couple have revealed the secret of a long and happy marriage: honesty. Susan and Robert Erskine spoke to STV News about their 75-year relationship. The couple, who live in Bo’ness, have not spent a day apart since Robert’s three-and-a-half-year posting to Iraq during World War II. Even when he was packed on a train, bound for the battlezone, Robert, now 101, found an inventive way of letting his pregnant wife know he was being posted overseas. Surprisingly, the billet doux eventually reached Susan and she found the gesture very romantic. The couple, who have had three children, six grandchildren, and six great-grandchildren, met at a church dance when Robert asked Susan join him on the dance floor. The Erskines have some advice for young couples thinking of marriage. They counsel not to rush into nuptials and to avoid debt at all costs.